De Blasio To Announce Car-Free Lower Manhattan Today! After years of pressure from activists, Mayor relents and agrees to pedestrianize the entire area below Chambers Street. Please note: This story, posted at 12:01 a.m. on April 1, was an April Fool’s satire. Mayor de Blasio will announce today the creation of a massive pedestrian zone in Lower Manhattan — effectively making the area below Chambers Street off-limits to cars and trucks. The announcement is expected this morning at 10;30 at the intersection of Chambers Street and West Broadway, where the NYPD hastily erected a bollard barricade late on Sunday (photo above) in anticipation of the change in city policy. A source at City Hall, who was permitted only to speak on background, said such barricades had also been built on Greenwich Street to prevent cars from going below Chambers. Similar barriers have been set up on St. James Place and South Street near the Brooklyn Bridge to prevent similar driving on the East Side. In the coming days, barricades will be erected on Warren, Murray, Albany streets and Battery Place to prevent drivers from entering Lower Manhattan through Battery Park City. Drivers will still be permitted to use the FDR Drive and West Street, but they will not be allowed to exit the roadways below Chambers on the West Side or the Brooklyn Bridge on the east, the source said. Delivery trucks will no longer be able to enter the zone, but the Department of Transportation will create space on the edge of the vehicle-free area for the unloading of goods, which can then be delivered via cargo bikes on existing roadways or handtrucks on the sidewalk (no wider than four feet). The move follows similar street restrictions in numerous European cities, such as London, Oslo, Madrid and Barcelona. Mayor de Blasio has long resisted calls to follow the lead of other world capitals, so it is unclear what motivated the mayor to change his mind. 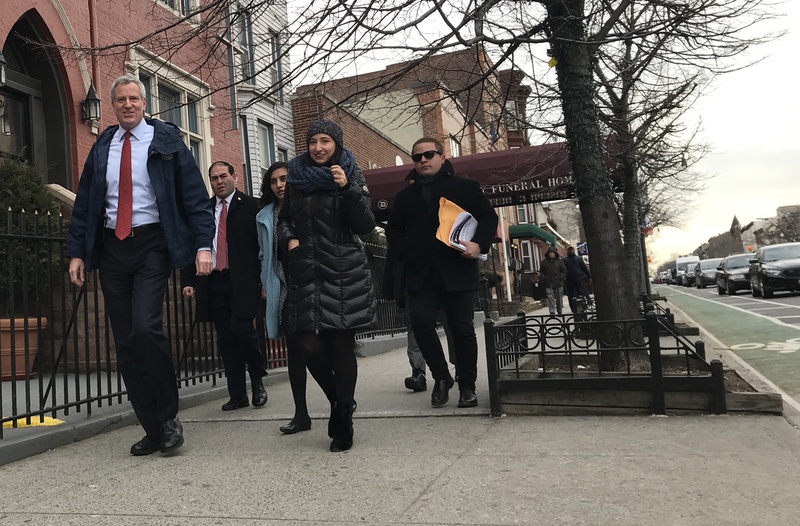 A source in city government told Streetsblog that the mayor was still smarting from a recent exchange with a reporter who accused him of not being a pedestrian. As word leaked out about the mayor’s plans, world leaders shared their support. Was hoping this was part of the congestion charge at least. Imagine how it would boost public health and reduce pollution, it would pay for itself. So disappointed he’s not doing the entire city…. And in other news, President Trump announced his support for the Green New Deal. This is remarkable as the mayor is clearly angry he is forced to walk in the second photo. It looks like the parking protected bike lane keeps even his 3 SUVs from parking in the bake lane. So annoying for him. The April Fool’s joke is the one we’ve been living every day since Jan 1, 2014: that we have a daily driver as a mayor of the most walkable and transit-friendly city in America. Nothing can top our reality in terms of absurdity. Argghhg. You totally got me. I was so excited, and now I’m just disappointed again at the lack of leadership from DeBlasio. Next you’ll be telling me BdB biked to his gym! I was fooled. I’m such a fool. A folly. Fool’s Errand. Foolishness. Why say this is an April Fool’s joke before you can even read it? It’s still April 1st… ! This is the most depressing 4/1 joke ever. Madrid, like London before it, leads the way. NYPD Is Making Midtown Sidewalks an Obstacle Course — Where’s de Blasio? The mayor controls the streets but is nowhere in sight as NYPD security theater puts the squeeze on Midtown foot traffic. Park Row in Chinatown, which NYPD has treated as a security checkpoint since 9/11, will get a bi-directional bikeway and 10,000 square feet of painted sidewalk from Worth Street to Frankfort Street.